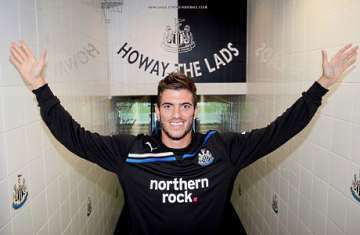 Newcastle United get story straight on Santon injury | NUFC Blog. Santon: Confusion over knacked knee. Newcastle United have issued a statement on their website in an attempt to get things straight on Davide Santon’s recent training ground injury to his right knee. As I pointed out in this story yesterday, the ex Internazionale wing back has a history of right knee problems stemming from an lateral meniscus tear picked up in an Italy Under-21s game against Luxembourg in November, 2009. After Santon had surgery and returned to playing, the injury returned and more surgery was required, resulting in another period out of the game, and a drop in form on his second return. “Unfortunately Davide has hurt his knee in training and been sent for a scan. “It is an injury he has had before, we think it is a cartilage problem. We thought it was best to send him for a scan. “It’s a worry. It looks like it could be a cartilage and it’s not something you want when he’s just come into the building. Maybe we’re looking at a month out. “He’s going to have to get it cleaned out – it’s keyhole surgery nowadays which is a quicker operation but it will certainly mean at least four weeks out. However the club have now stepped in to stress that the current right knee injury has nothing whatsoever to do with Santon’s previous right knee issues, and that the right knee in question was fine when he underwent his medical before joining the club at the end of August. In other words an attempt to assure fans that in their quest for a bargain, they hadn’t puchased a player with a recurring injury which would keep coming back. “The player had a scan on Thursday afternoon and will undergo treatment over the weekend and will be reviewed by a specialist early next week. “Davide was injury-free when he completed his pre-signing medical examination and scans. As to whether this meant that Santon’s current injury ISN’T a lateral meniscus injury, or indeed a cartilage injury in general after all, they didn’t say. Hey Worky, what do we know? I am staying positive on this one – in fact, I’m staying positive on just about everything with NUFC. “What can’t be fixed must be endured” and certain things we just can’t fix right now, but we can stay positive. And in the grand scheme of things, despite Bill Shankley, football ain’t really a matter of life and death – it’s a game, a sport; and when we loose track of that, well, we loose track of Life. HWTL! and let’s hope for 3 points at Villa Park. what a load of crap the club spew…. Its all connected isnt it, not matter which way you look at it.. This will be his third op on his right knee and he is only 20 ffs… its all connected in that he clearly has a right knee problem at the very least, perhaps a left too. Its all related to his knees, and what makes it worse is that by our clubs own admissions, they knew he had dodgy knees before he was signed. I feel for the guy as he looks like he could have been great, will we ever have a season when we can play him the full one without him breaking down??? Not a chance. It reminds me of dyer a little, i think he was the most gifted player to play for us since gazza, he just had leg issues that could never be fixed.. ever. Not sure that the other clubs who wanted to sign him would have been interested if he had a long-term injury problem. Knowing this regime’s lack of willingness to spend money on transfers if possible then I’d expect that the medical he had was as thorough as any at other clubs. Players can pick up injuries (they are part of the game/training),and I just hope that his injury isn’t quite as bad as we all fear. In fairness to the club, making a statement so soon after the injury is not like them, let’s hope that it is their attempt to start keeping fans informed. More importantly, the press were beginning to speculate about the severity of the injury and how long he might be out before the specialist has even seen the lad. He’s out injured at the moment which is disappointing as I amongst many wanted to see him play asap, but remember we’re unbeaten so far this season and the lads who have played deserve the credit for those results. Keep up the good work at Villa lads and let’s hope for positive news re: Santon next week! I can’t include Marvuex cos I don’t realy know him well enough – but certainly a midfield sub, with Ba to cover Best. Shame we can’t get Santon & HBA in there cos the formation seems made for them. And (a big AND and a big regret) it looks ideal for Ranger to come on as sub and run at a tired defence – that wanker has really let us down, doesn’t to thicko see what an opportunity he’s throwing away? Great to have a game at last – and on a saturday as well! Calling Dr. Steadman, we got a new patient for you, with maybe more in the near future, any chance of getting a group rate ? Big Al. @ Hatem send their regards ! A 4-1-3-1-1 lineup, could do some damage, with at least 4 goalscorers (Given up on Jonas) or we could have possibly 5, with Obertan replacing Jonas. chuck@7 – wow, I like it – if all fit.